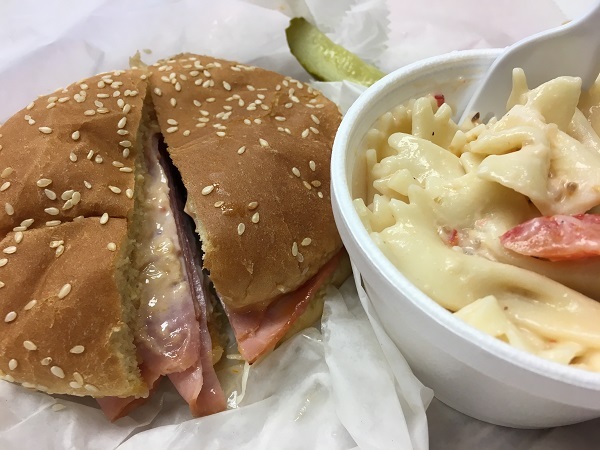 Figgy’s Sandwich Shop, Chattanooga TN – Marie, Let's Eat! I had lunch a couple of times recently at this delightful little place across the street from Innside. Road construction had freed up a lot of parking spaces but also hurt their business a little, so I added them to my regular rotation. 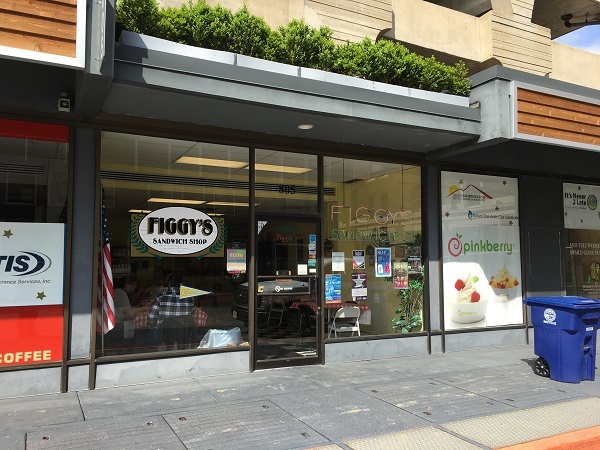 I’ve been aware of Figgy’s since moving here, but hadn’t made it a point of visiting. One day in late March, I decided that I’d swing by and see whether there might be some street parking available. I didn’t feel like paying lot prices and probably doubling the cost of my lunch, and so I had a plan B in mind, but it turned out to be completely unnecessary. I got off on MLK and made a left on Chestnut into an almost totally vacant street. The city had begun a long project redoing 8th street for a couple of blocks, so Chestnut dead-ended there with a chain-link fence. The problem, which I didn’t realize at first, is that this wasn’t a week-long project but a months-long one, and it separates Figgy’s, along with Innside and Peet’s Coffee Shop, from all their pedestrian business north of 8th Street. Ouch! You know, whenever possible – and it’s really not often all that possible – I prefer to eat at a place twice before doing a story about it. I enjoyed my sandwich and resolved to spend a little more money here over the next couple of weeks, giving me more chances to sample their menu. The Figgy’s Special is pretty low-maintenance as sandwiches go. It’s a hot ham and turkey sandwich with a really generous smear of their special sauce, which is tangy and not too unlike Russian dressing. It’s certainly not bad, but I really think it could use some lettuce and tomato, which they’ll happily add if you ask. I had this with a side of pasta salad instead of chips. After eating, I went outside for one of those very rare occasions where I could take some photos of the front of a restaurant from the middle of the street without worrying about any cars running over me. That’s when I realized how Figgy’s business might have taken a tumble with the construction. I remembered that about a month previously, the wonderful Stilesboro Biscuits outside Kennesaw GA had put out an appeal on social media because ongoing work on the water line along the street out front had killed their business, with many potential customers assuming they were temporarily closed when they weren’t. But Figgy’s business is overwhelmingly foot traffic, and anybody north of 8th would have to take a longer and much more circuitous path to get here. Yikes! I could totally imagine many, many people just calling a chain sandwich delivery place instead. 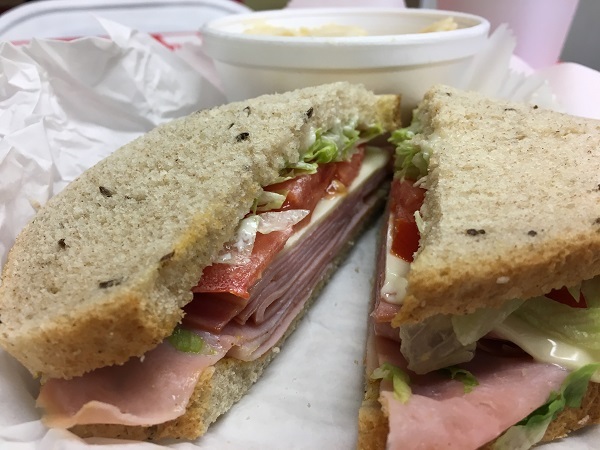 The next week, I came back by – this time there were a whole four other cars parked in the segmented block of Chestnut – for a hot ham and Swiss sandwich on rye, and this time thought to have them add that lettuce and tomato. It was very tasty. They were a little slower on this visit, but I was happy to see a good crowd line up while I ate. I asked about how long this shop had been here, and the woman working the register said that they’d been on Chestnut for more than a decade, but the restaurant, which is today owned by Larry Jackson, dates back to the seventies and she believed it started out on Broad Street before moving around to new homes. It’s a good little place and I’m glad to have discovered it. If you’re in Chattanooga, swing by one day this week for lunch. You’ll get a good meal and they’re certain to appreciate your business! If you enjoy classic adventure television and movies, then come visit our other blog, where we’re enjoying thrilling shows from the seventies in the company of our five year-old son. It’s called Fire-Breathing Dimetrodon Time and it’s updated several times each week! Posted on May 1, 2017 by Grant G.Posted in chattanooga, sandwiches, tennesseeTagged chattanooga, sandwiches, tennessee.